In this page, you can find some of the more popular dishes I taught over the years. Some of these recipes uses fresh ingredients like galangal, lemon grass, fresh turmeric, dried chillies, shallots, coconut cream and shrimp paste. Generally these are Nyonya meat dishes with Malay inspirations of Curry Kapitan, Beef Rendang, Bak Char Rempah, Kerabu Kay or Steamed Chicken Salad. Some are with Indian inspiration like Kari Kay or Curry chicken with potatoes, Inche Kabin , Tamarind Egg Omelet, and Hong Bak or Classy Pork. These are recipes that has dried spice powders like coriander, cumin, fennel, dried turmeric and chilly powders. Coconut cream is also widely used in these dishes. Eating the old way but learning the new recipes. By the early 20th century, the Straits Chinese has grown in numbers. Some got very established and wealthy. Some even have male servants who cooks for them. The old Chinese inspired favorites are unforgettable. Today, we are still enjoying the old food like 5 spiced pork roll, duck in salted mustard soup or kiam chye ark, tau ewe bak or dark sauced pork stew. I may not be totally right but fusion is not only with Malays, Indians or Chinese. Those days 100 to 150 years ago, we were having British, Dutch, Armenians. Nutmeg powder, Worcestershire sauce, mustard powder are inspiration from our founding fathers. Select these dishes and the stories goes on in the class. Curry Kapitan is interestingly the most popular dish to cook. Having to work with fresh spices and root of galangal, turmeric, lemon grass and candle nuts is something, many oversea guest wants to try. Some like to know how to use it, some have not seen it before and the interest and excitement grows form the wet market tour. The citrusy flavored curry is well balanced in both flavor and taste. One can taste the creaminess of candle nut, coconut cream also the usage of lime creates enough explosion of flavor. They got to cook this dish. 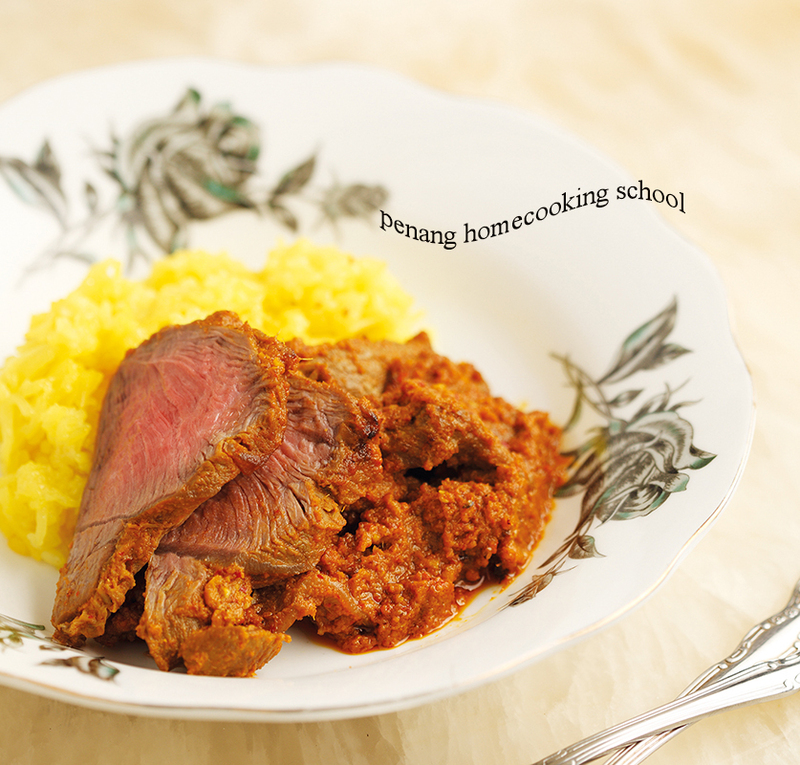 The beef rendang is ever popular for its creaminess and nuttiness. So many were surprised and happy to learn how to make their fresh coconut shreds crispy and in turn nutty to create another texture. The beef is cooked in fresh roots of galangal, turmeric, dried chillies and coconut cream. Most guest goes home saying, it isn’t as difficult as we think. Bak char rempah is literally translated to Stir fried spicy meat. You can use any meat to stir fry and hook it up within minutes. Once you get the wet fresh spiced totally grind finely, just wok and roll. It goes so well with hot white rice. Kerabu Kay is Steam Chicken salad using sambal belachan sauce. It is a great relish, with unique piquant mix of calamansi lime juices and our unforgetable sambal belachan of fresh red chilly pounded finely with toasted shrimp paste. With some black fungus and torch ginger cut in chiffonade, it springs the relish and create a sparkle in your eyes. The cutting technique of chiffonade and julienne are knives skills which can be mastered. Kari Kay is cooking chicken with both wet spices like shallots, chilly and lemon grass. Dried spices or powders of coriander, cummin, fennel are used to cook our traditional chicken curry. 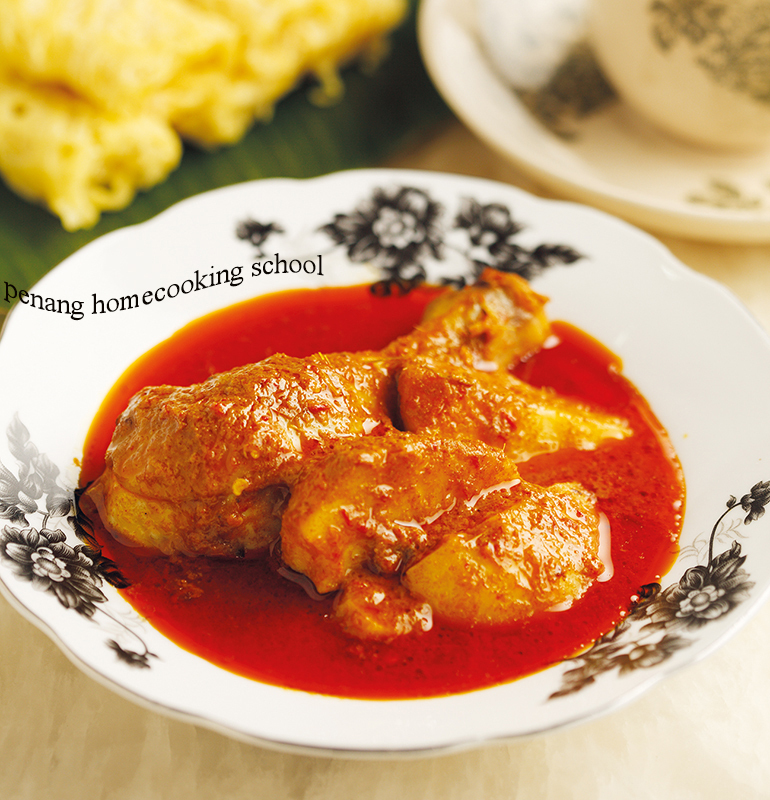 This curry is the most important curry for the Nyonyas, as it is part of a gift bundled with yellow sticky rice called Nasi Kunyit offered to relatives and friends to announce the new born. For me, it is a curry of friendship within the communities of Malays, Indians and Chinese. Many of our dishes has this wonderful marriage of people. We are truly blessed food brings us together in the true sense of the word. Not just eating it but blending it into our society. Inche Kabin is really deep fried chicken, real crispy. There is no usage of crispy flour but deep frying techniques to make it crispy to perfection. We served this with a special sauce with Worcestershire sauce and some mustard. Another mind blowing thought, where did this come from? Tamarind for your omelet? Well my guest says it is their new breakfast. Sourish and sweet, it wakes you up if you are still in between sleep. Our egg belanda has onion slices, ginger and bean paste are great combination and we use in many of our vegetable stir fries, . It stands out on eggs, truly a winner. Hong Bak or Classy meat is a stew. Duck, chicken and pork are all time favourite for cooking with sand ginger roots and nutmeg powder. Coriander makes it full bodied and dark soy sauce sweetens and add a lovely tone to this stew. It is soul food for me as it requires slow cooking in duck or pork. Using chicken, you can served the dish in 20 minutes. Solve your problems if you have slow cooker. Turn it off after 2 hours. Duck in salted mustard is a top favorite for us. Overseas Chinese comes back wanting to learn grandmothers recipes. Kiam Chye Ark is what they called this dish. It is a soup dish using nutmeg seeds, preserved sour plum, cloves and lots of white and black pepper. Nyonyas prefer white peppercorn crushed to make it more spicy. The salty mustard has to be soaked for hours before using or the whole bowl cannot be eaten. Pig trotters, deep fried duck or whole duck are added to make this soup. This is really a dish one must love meat that are soften., almost breaks in your mouth. No biting or chewing is needed. Slow cooking is indeed an age old culture to cook this soup. 5 Spiced Pork roll is called Ngoh Hiang Lor Bak. Which means pork marinated with 5 spice powder. It has many ingredients to make it taste delicious. Chunks of water chestnuts gives the crunch. No egg is added but potato starch is the binder. Wrapping in bean sheets is fun. Deep frying the rolls to cook it totally is important. So come and learn how we make all this traditional and slow cooking food. I am so pleased our heritage food is getting very popular. It is my dream coming thru. Tau Ewe Bak or dark sauce pork is yummy. Lover of belly pork, this dish is for you where ever you are. Slow cooking the marinated belly pork with dark sauce, sugar, white pepper and heaps of crushed garlic is required in this lips mucking stew. Traditionally, it is a every day dish with deep fried firm tofu and hard boiled egg. 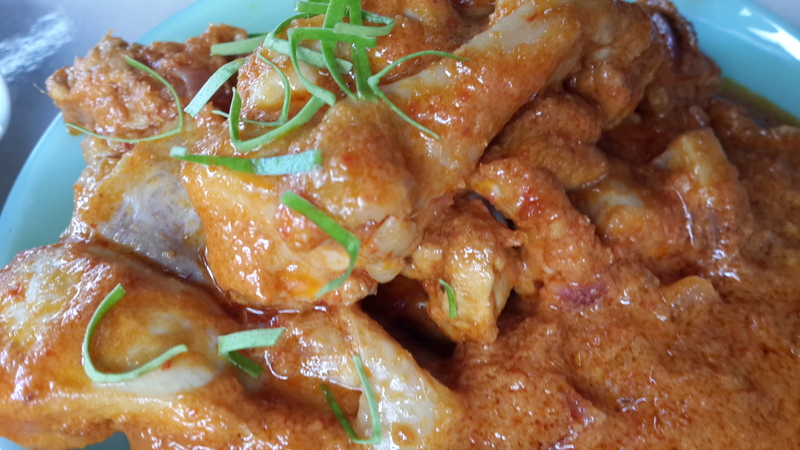 Complete the dish by serving with sambal belachan. Crazy but workable combination, should be very Chinese but eaten with Malay sambal belachan. Don’t shake your head cos it works. Ready to book our cooking class, read here first. Now you are really ready for booking if you have read the above sentence. I must tell you, every guest is important to Chandra and I. We love meeting and knowing you. Thank you kind people for reading and browsing. Hi Pearl, I am a baba living in New Zealand. Thank you for reminding me of Penang food of my youth and for the recipes that will help me recapture the taste of Nyonya food. Hi Ben, thank you for visiting my blog. Do come often.